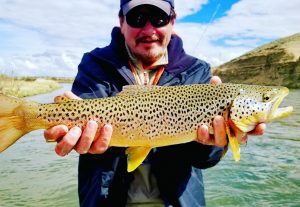 Bighorn and Wind River Fishing Guide Report July 10 2018: The Bighorn River is starting to quickly drop and current water flow are at 3550 CFS (Click HERE to see most current river data). With the lowering of flows, the river has slowly started to come into shape and fish are more actively feeding on the fly. We definitely have seen an increased number of nice sized trout (19-22 inches) coming to the boat. Fish are still quite picky in what they eat, so taking time and changing flies to figure out what they are keying on is crucial right now. The river will only continue dropping and fishing will continue to get better with more steady and lower water flows. Keep posted for more to come! 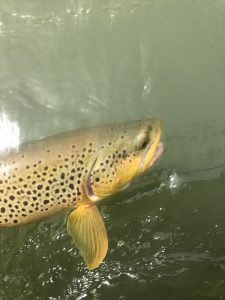 Wind River & Dubois, Wyoming Fishing Report: The Wind River is finally coming down and clearing up. If this weather holds, we will be fishing the Wind River any day now. 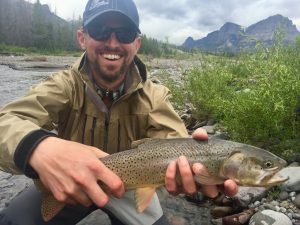 The tributaries are also dropping and wade fishing is becoming easier and the Yellowstone Cutthroats are definitely hungry and looking up for flies. Dubois waters are coming into shape and you cannot beat the mountain scenery on pristine freestone streams. We have been busy guiding both Dubois area and the Bighorn River. Keep posted for more reports to come with another busy week on the water. If you are interested in a fly fishing trip or have any questions, we can be reached on our CONTACT PAGE. 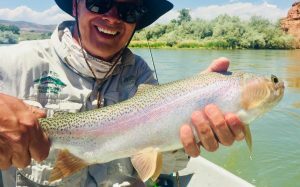 Dubois Wyoming Fishing Guide Report Wind River Tributaries Our guides have been busy guiding in Dubois, Wyoming the past two weeks and the rivers and tributaries are coming into shape very nicely right now. We have been predominantly catching nice sized Cutthroat Trout and the fishing is improving by the day. Our guides have been doing well with dry flies and nymphs. 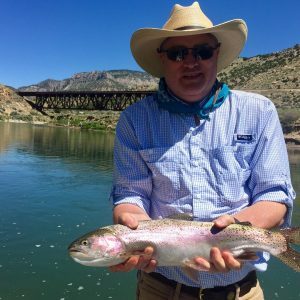 Not only have our guests caught some beautiful trout on the fly rod, but they have also seen some amazing mountainous country and amazing wildlife. On a guided trip, we recently had the amazing experience of seeing a sow and cub grizzly bear along the same river we were fishing. All guests were safe and with bear spray and there was not an incident. 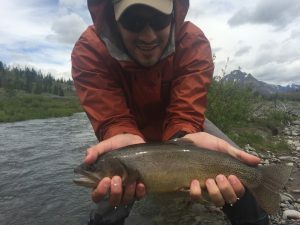 Experiences and fishing like this is why we guide in Dubois, Wyoming. Our guides are local, experienced, and live in Wyoming year round unlike some other services in the area. The owner, Jeramie Prine, is a fourth generation Wyomingite and his family has been running the Ram’s Horn Guest Ranch for 71 years in this area. If you are looking for true local knowledge and fishing experience, then give us a call and we will organize a fishing trip of a lifetime. To see current Wind River water flows click HERE. 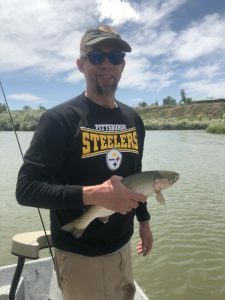 Green River Fontenelle Wyoming Fishing Guide Report Our guides have been very busy the past two weeks and the summer fishing season is kicking off nicely with a lot of big healthy fish brought to the boat and wonderful guests. This report we will focus on the Green River below Fontenelle with more reports to come on Dubois and the Bighorn River. The water levels and the fly fishing are very good on the Green River right now. Water levels have tapered off from the 6000 CFS last week and are down to 3470 CFS today. 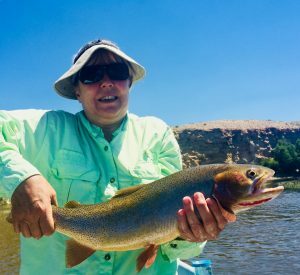 Our guests Barry and Laurie had a lights out day with multiple trout (Browns, Cutthroats, and Rainbows) brought to the boat. This was not their first rodeo and they absolutely slayed it. We snapped a few trout off that were unbelievable. Our guides have over ten years of guiding these waters and are very knowledgeable when it comes to fishing the Green River below Fontenelle. It is truly an amazing fishery and we are very grateful to be able to guide this river. To see current river flows click HERE. To see more about our professionally guided fly fishing trips click HERE. The Upper Wind River Basin (that feeds the Bighorn River) has seen some pretty extreme weather and precipitation this weekend and this morning. The weather pattern seems to be working its way out, but we will see how it affects the Wind River and Bighorn River flows. If you are interested in a memorable and fun fishing trip with professional and personable guides give us a call or send us a note on our Contact Page. Guides Jeramie and Jeff had a fantastic day on Triassic Lake with the Lowham Brothers this past week before the rain and bad weather moved into the region. It was another beautiful bluebird day at the lake and the guys landed a crazy amount of trophy Rainbow Trout. We hope that you enjoy this video of the Damselfly hatch that was unbelievable. It was neat to see such a prolific hatch. 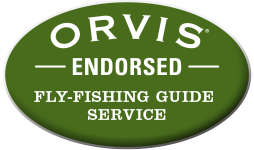 Click HERE to see our Orvis Fly Fishing Reports on the Wind and Bighorn Rivers. Our guides have been busy scouting and guiding on Dubois waters since the Wind River itself is blown out right now. There is plenty to fish in Dubois, Wyoming if you know where to look, and it definitely helps to have a boat to access some of the mountain lakes in the Wind River Mountains. We have several trips going out in Dubois over the next few weeks and we look forward to reporting on conditions as they become more favorable. Thanks to the locally run and owned Cutthroat Fly Shop in Dubois (website coming soon) for the great trip with the Atlanta and South Carolina crew. We had a great day on the water yesterday! 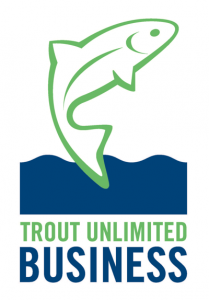 If you are in Dubois, be sure to stop in the shop for all your fly fishing gear and needs. Dubois Wyoming Kids Fishing Day Dubois Anglers and Wildlife Group (DAWGS) in conjunction with Wyoming Game and Fish and the Forest Service put on a fantastic day for all the kids at Pete’s Pond today for Kid’s Fishing Day. 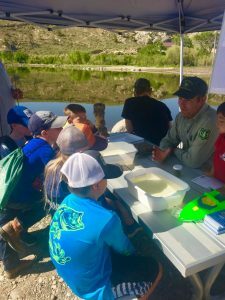 It was so fun seeing all the young anglers learn about Wyoming fisheries and ecology of the area. It is good to see our youth enjoying the outdoors. It can only help in future conservation of our resources. Pete’s Pond is a HUGE addition to the Dubois area and community. What a great location and wonderful use of the area. It will definitely bring a lot of happiness for many generations to come. Thank you to everyone who made this project possible! What an great community resource! If you are interested in a guided fishing trip on the Wind River or in the Dubois area please us a note on our Contact Page or give us a call at 307-349-3331. 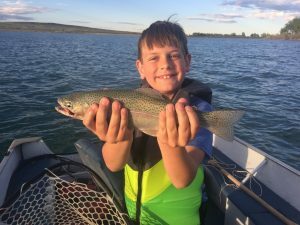 Bighorn River Fishing Report: What can we say? It is early summer runoff for the Bighorn River. Our water flows have gone from 1800 CFS up to 4000 CFS this week. We are seeing off colored water and a lot of moss floating in the river. Fishing is slow right now until the flows stabilize at this new level. We will probably see the Bighorn River at 4000+ CFS for the next ten days or until the runoff has subsided. We should see a more normal water year this summer unlike last year that had massive big flows. There is even talk about eventually dropping the Bighorn River to normal irrigation flows (1300-1500 CFS) as soon as runoff is over. Fishing will remain tough until the river settles down and flows stabilize. Hot flies: annelids, baetis, and attractor patterns. 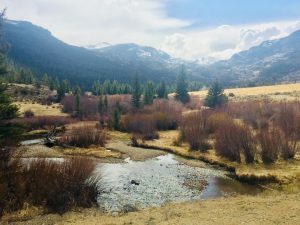 Wind River Dubois Fishing Report: The Wind River in Dubois is starting to peak in runoff and still not really worth fishing. 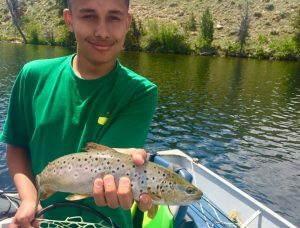 There is still plenty of great fishing opportunities to be had on the several tributaries of the Wind River and plenty of lakes that are fishing very well. Our guides know every nook and cranny to be fished right now and are happy to show you a few of our early season fishing spots right now. It will not be too long before the Wind River starts coming down and we are fishing it! Keep posted for more to come. Click on our GUIDES PAGE to learn more about our experienced and personable local guides. 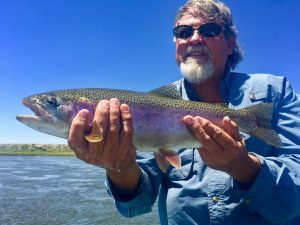 Green River Fishing Report Fontenelle Wyoming The fly fishing this spring on the Green River has been very decent. We have been enjoying fishing the Green River since February due to not as much snow in the drainage this season. With that said Green River flows are have started bumping up. Guide Jeff Judkins and long time guest Ed spent two days on the Green River. Fishing was very good with great weather compared to other parts of the state up north. The guys found success on a variety of flies, and blue wing olives were in full hatch with more cloud cover. The guys got into some nice and healthy Browns and Rainbows. Green River water flows will be doubling water flows by the end of this week from 3000 cfs to 6000 cfs by Thursday May 24, 2018. To follow the most current water flows on the Green River click HERE.